When I lived in Massachusetts, I enjoyed an amateur astronomy hobby. At night, I could walk out to my central Mass backyard and easily see the Milky Way. And that was without any dark adaptation. I sold all my astronomy gear (an SPC-8 with the de rigueur slew of stuff) after moving to Seattle. The sky quality I had in my Massachusetts backyard was now at least 30 minutes away by car. This increased hassle factor, and some other personal matters, made jettisoning the hobby the right call. There are probably billions of dollars of telescopes, microscopes, boating gear, camping gear, fitness machines, etc. in America’s attics, and I’ve never been inclined to add to the collection. I’m a big believer in discarding or selling something if I haven’t used it in the past year – or don’t intend to in the coming year. Well… The astronomy bug resurfaced in May! I don’t know why, but it did. And I’m thoroughly enjoying it! I’ve been brushing off my observing notes, familiarizing myself with today’s tools, and ruminating about my goals this time around. Right now I only have a pair of Adlerblick 10×50 binoculars, so I’m confining myself to lunar, planetary, and easily notable deep sky objects. If I’m still at it four months’ hence, I’ll start pricing large scopes. One type of service that didn’t exist back in 1992 are night sky forecasts. I’ve found a couple; my favorite is Clear Sky Charts. 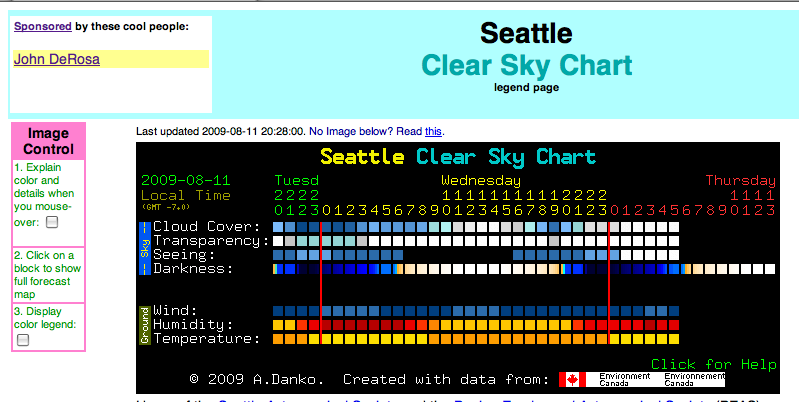 Clear Sky Charts applies forecast models to your location’s weather information, and predicts the night sky quality for star gazing. It factors in the cloud cover, transparency (based on water vapor concentration), seeing (turbulence), darkness (light pollution), wind, humidity, and temperature. This is very useful information for amateur stargazers. If your location is in CSC’s database, it’s a dandy service. If your location isn’t in CSC’s database, you can nicely ask the maintainer and he’ll add it. Very cool!